Nirkoda! on Saturday | Nirkoda! Note that the credit card price is higher due to processing fees. You can also ask Aaron to swipe your physical card at session. Lines workshop, 7:30 to 8:30pm. $5. We will learn approximately two line dances and dance or review those taught previously. 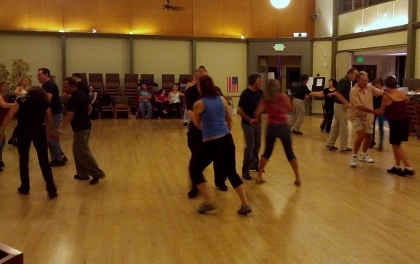 Regular session, 8:30pm to midnight, $10. It's an open-dancing style harkada with requests, DJ'd by Aaron Alpert, with little or no teaching. Children and full-time students under 25 are free. No one will be turned away for lack of funds; if this is financially burdensome, pay what you can. If you have questions, email me. 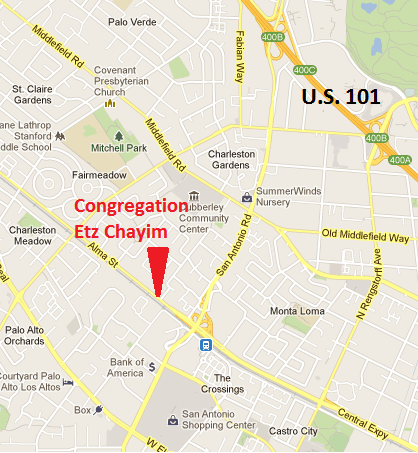 We'll be dancing at Congregation Etz Chayim, located at 4161 Alma Street, Palo Alto, CA 94306 (link to Google map). Getting there is easy — it's just 5 minutes south of the 101, close to San Antonio Road and Central Expressway. There is abundant free parking in the temple's lot. 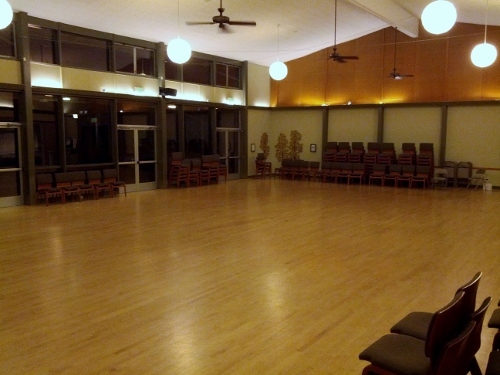 It has a great wooden floor with lots of space and a house audio system (picture below).